Not many Minor Leaguers can say they've been traded straight-up for a Major Leaguer. Fewer still can make the claim before they've even played a professional game. Yordan Alvarez fits that bill. Such a distinction can put a lot of pressure on a player as he tries to hold up his end of the bargain during the early days of his career. According to his manager, however, Alvarez isn't getting lost in the big picture. "I think he understands the situation and the hype that can come with a deal like that," said Class A Quad Cities manager Russ Steinhorn. "But you can tell he's focused on being the best player he can be where he is right now and doing all the little things he needs to do to continue to climb the ladder and become a Major Leaguer himself one day." The early returns are certainly promising. The Astros' No. 14 prospect is hitting .360/.468/.658 with nine homers, six doubles and 33 RBIs in 32 games since joining the River Bandits on May 15. Since that date, only No. 100 overall prospect Bo Bichette (1.130) has a higher OPS at Class A than Alvarez's 1.125. His nine home runs are tied with four others for the most at the level over that span. "He's got a very advanced approach," Steinhorn said. "He sets himself up well. He's got a good swing path. He's got power that's showing up. But the most impressive thing for me is the way he focuses on good pitches. It doesn't matter if it's 3-0 or 0-2, he's not trying to force things. He's looking for a good pitch in a good spot, and when he gets it, he does a good job of making solid contact. You can't ask for much more." There's doubting that. Among Minor Leaguers with at least 130 plate appearances this season, Alvarez's 205 wRC+ -- a stat that takes into account offensive environment and puts it on a scale where 100 is the average -- trails only Bichette's 208. Rockies top prospect Brendan Rodgers, who hit .400 with a 1.119 OPS at Class A Advanced Lancaster, owns a 203 wRC+ by comparison. Alvarez has only 139 plate appearances under his belt after starting the season at extended spring training to get more acclimated stateside, putting him well behind Bichette (255) and Rodgers (222) in terms of sample size. But those are still some incredible peers to put into perspective just how dominant the 19-year-old left-handed slugger has been in his first taste of pro ball. The hit tool has always been the strongest part of the Cuba native's profile. He played two seasons for Las Tunas in the Cuban Serie Nacional at 16 and 17. In that second campaign in 2014-15, he was particularly impactful, especially for his age, hitting .351 with only 10 strikeouts in 125 plate appearances. The power wasn't quite there yet with only two extra-base hits in that span, but being 17, Alvarez was almost 10 years younger than the average player in Cuba's biggest circuit. The Dodgers saw enough with Alvarez's bat to sign him for $2 million in June of last year. However, their total investment was $4 million as the organization had already gone over its spending pool in the 2015-16 signing period, requiring a 100 percent tax. It was clear that Los Angeles wasn't the only club with its eyes on the first baseman/outfielder, however. Not even two months after he signed with the Dodgers, Alvarez was dealt to the Astros for reliever Josh Fields at the Aug. 1 deadline. The trade was a relatively minor one as far as deadline deals go. Fields had been moved to Triple-A Fresno in May after posting a 6.89 ERA in 15 appearances for the big club, but he had shown enough in his peripherals (2.83 FIP, 28.2 percent strikeout rate) to be worth a look in a Los Angeles bullpen that needed help down the stretch. The 31-year-old right-hander made four postseason appearances and has posted a 3.00 ERA over 27 innings this season, though he was optioned to Oklahoma City on Monday. Meanwhile, Alvarez had yet to suit up in an official capacity for the Dodgers before the trade. 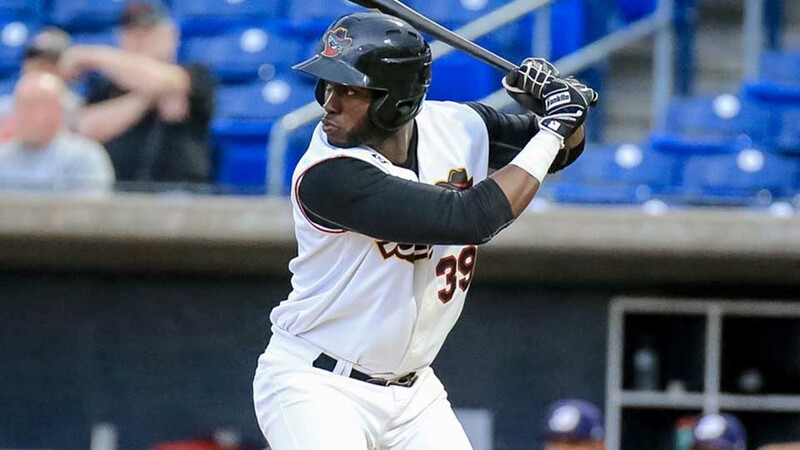 Three days later, the Astros assigned him to one of their two Dominican Summer League affiliates, and he did what he had been sent there to do -- he hit. He began his pro career with a six-game hitting streak and ended up with a .341/.474/.500 line with four extra-base hits and 12 walks in 16 games. Steinhorn, who was the manager of the Astros' other DSL squad, believes Alvarez's experience in his home country as a teenager helped him make such a smooth transition. "Coming from playing in a league like that, he knows how to play right away," said the River Bandits skipper. "You need to be in game situations at a high level, no matter the country, before you can grow in it, and you can see he has that experience in his higher IQ. He played there at such a young age. Obviously everyone wants to talk about hit, hit, hit with him, but there are a lot of intangibles there as well that you only get through experience." If there's something the Astros haven't quite figured out with Alvarez just yet, it's his defense. Listed at 6-foot-5, 225 pounds, he was mostly a first baseman in Cuba with limited looks in left field. He played mostly designated hitter in the Dominican Republic last summer and has been more spread out between all three spots with Quad Cities, making 13 starts in left, 11 at DH and seven at first this season. Steinhorn said the plan has been to keep working Alvarez at both positions in the field to build his versatility and noted that he's seen the 19-year-old handle himself well in left. In fact, eight of his last nine starts in field have been in left. An argument could be made for keeping Alvarez at one spot to maintain consistency in his first stateside campaign, but Steinhorn insists the defensive plan is focused solely on the long run and seeing where Alvarez will fit best in his second organization. "With the kind of hit tool he has, he can find a spot at the upper levels anyway," he said. "Sometimes, the hit tool alone allows for movement. But we want to make sure he has an opportunity in left, first or at DH as well. This gives him options. We don't want him to just worry about having to hit enough to move. Some versatility helps him in that way." Whatever the position, Alvarez has shown that movement could be an option ahead of schedule of late. He hit four homers over his last six games before the Midwest League All-Star break, and the circuit's pitchers had taken notice, intentionally walking him three times in that span. This is, of course, just the start of Alvarez's attempt to hold up his end of last August's trade, but Steinhorn enjoys watching him take the steps toward that goal. "It's quite impressive for an 18-year-old at the time to go through all that, get here and have the type of aptitude to succeed right away," he said. "You have to be a certain type of player to be a part of a trade like that, and seeing him play every day is a special experience."